The most popular part of the CZ Tilburg Ten Miles is the competition and recreation run over 10 English miles 16,092 meters. The course is IAAF certified and there are top times. For the thousands of recreational participants, enjying the atmosphere and encouragement is on the way. An experience that you will not soon forget. The CZ Tilburg Ten Miles started in 1988 as a treadmill in the Moerenburg area on the east side of Tilburg.Already in 1989 the event was a regional competition race.Soon Dutch and Belgian subtoppers were also at the start.In 1992, the first African runners took part and the end times for the first time went below the 50 minute limit.At that time the organization was working on a plan to move the event to the center of Tilburg.In 1993 was the first center edition of the CZ Tilburg Ten Miles with a separate race course about 10 kilometers for women.The first edition in the center was an extraordinarily interesting one with five athletes close together including the best Dutch athlete of that time Bert van Vlaanderen. The absolute highlight was the performance of a then unleashed Haile Gebrselassie on September 4, 2005. The Ethiopian improved the world record on the 10 English Miles from 44.51 to 44.24, a world record that stands today.Bernard Koech came in 2014 with a time of 45.12 the closest in the vicinity of this absolute world performance.To date, the city editions have all been won by East African athletes.In terms of width, there was a strong field of participants in the jubilee year 2012 with no less than half a dozen athletes under 46 minutes.During the 2015 edition, this performance was repeated with 5 runners under 46 minutes, of which Bernard Koech was the fastest for the second year in a world time of 45.21 minutes. Of the Dutch, Greg van Hest, Kamiel Maase and Khalid Choukoud have manifested themselves strongly in Tilburg.Van Hest was three times the best Dutchman with 46.46 as best time and personal record.Only Kamiel Maase was 46.44 times faster than the Tilburger.Khalid Choukoud equaled this achievement in 2013, after which Abdi Nageeye set the Dutch record of 10 EM in 46.40 in 2015 (during a photo finish with Choukoud).During that edition, Nageeye also ran an official Dutch record of 43.29 en route after 15 kilometers, which was in the name of Khalid Choukoud (Tilburg, 2013). In the years 2009, 2010 and 2011 Tilburg had the NK 10 kilometers on the road and the national top athletes were referred to that part.Successively Martin Lauret, Koen Raymaekers and Khalid Choukoud took the national titles in those years. Already in 1989 the event was a regional competition race and from 1990 Dutch and Belgian subtoppers were also at the start.In the early years the women competed in the 10 EM competition with Petra van Limpt (Prins Hendrik Vught) in 1991 with 58.14 being the fastest. In 1993, the first center edition of the CZ Tilburg Ten Miles was held, with a separate competition run of 10 kilometers for women: the Tilburg Ladies Run.For years, the tradition of a race (without running) for women has been maintained.A field of 50, 60 women was always sought.The level was high from the start, partly because of the good contacts with the German athlete broker Volker Wagner and the personal approach of the Dutch top athletes.The role of Wagner was later taken over by Global Sports, the Jos Hermens office. Partly because of this, the winners in the women were always of exceptional class and often belonged to the world top.The win went 5x to Tegla Loroupe, 3x to Lornah Kiplagat, 3x to Susan Chepkemei and 2x to Mestawat Tufa.Wilma van Onna was 3 times successful with the Dutch women as well as Irma Heeren, while Lornah Kiplagat was twice the best country companion.Three years in Tilburg for the women a 5 mile run where the then debuting Kenyan Lornah Kiplagat in 1997 established an unofficial world record by 25.09. In 2011 the Kenyan Joyce Chepkirui ran a new course record with 30.38.It was the Best World Year in 2011!In 2012, no less than two athletes finished within 31 minutes, a unique achievement.At the end of the year, Tilburg turned out to be the best road race for women globally.In 2013 Tirunesh Dibaba reached a new course record with 30.30 and the world's 4th best performance ever at 10 km.This also meant that Tilburg scored winning times under 31 minutes three years in a row.Betsy Saina continued this series in 2014 with its victory in 30.46, the best world performance of that past year. In 2015, for the fifth time in a row, the magic limit of 31 minutes was walked, this time by the surprising winner Genet Yalew in 30.58 minutes.She was closely followed by world class player Shalane Flanagan, who not only finished second with a time of 31.03 minutes, but also ran the old record (from 1990!) From the books.Defending champion Betsy Saina ended up in third place this time. 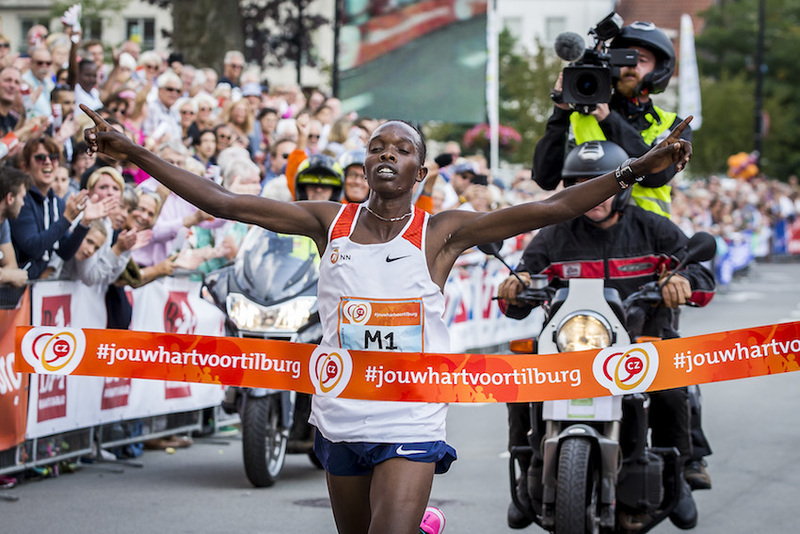 The route in Tilburg is known as one of the fastest in the world.The 45.03 that the 19-year-old Rodgers Kwemboi from Kenya achieved on September 3, 2017 during the CZ Tilburg Ten Miles is the best world achievement on the 10 English Miles of 2017. With the 45.06 of Evans Chebet, Tilburg also has the second place in this prestigious ranking.The best world time ever run on 10 English Miles since 2005 with 44.24 in the name of the now legendary Ethiopian athlete Haile Gebrselassie, of course walked in Tilburg.Also in the women several times a performance was delivered in Tilburg which was in the top 3 of the world rankings 10km women. In 2018 all courses will have a new course.This has to do with, among other things, the temporary bus station next to Tilburg Central Station.The start will remain on the Burgermeerster Brokxlaan, but will be the next edition at the Wagenstraat.From here the 5 km, 10 km and 10 EM routes cross the Besterdring, Veldhovenring and Wilhelminapark.In addition, a passage on the Esplanade of the university campus was realized for the 10 EM. For the 1 EM, 5 km and 10 km use is made of the tunnel Willem II street passage, the Willem II street and the Stadhuisstraat.This promises to be an attractive part of the course.The last kilometer over the short Heuvel, the Heuvelring and NS square remains unchanged.The use of the Koepelhal and Wagenmakerij will also remain as in 2017.